This is a post that I've altered a bit from my own blog. After my lack of success with Saturday's Readathon, I don't have a review to write. So I thought I'd share some thoughts about my favorite book: Gone With the Wind. I'm sharing this in the hopes of hearing what other people have to say about their favorite novels, not in the expectation that other people will share my feelings towards this particular novel. Lately, I've been agonizing about what book to read. I've started several that seemed promising, but they just didn't stick. They just didn't grab me in the way I was wanting a book to grab me. So I was very surprised when the answer to this conundrum attacked me one night in the shower about a week ago. In a very Field of Dreams kind of moment, it dawned on me--I should return to my roots, I *need* to reread Gone With the Wind. So simple. "Duh, Lori. Duh" was my response. I started reading it as soon as I was able. I turned on the fan so that I'd have to pull up my quilt. I read the preface written by Pat Conroy. As soon as I started reading the preface, I felt a compulsion that I hadn't felt before. I was happier in my reading life than I have been in a long time. I knew that my new, albeit temporary, motto would become "If I get this (homework, errands, sleep) out of the way, then I *get* to read Gone With the Wind!" I actually bragged to one of my best friends about it. Not because I have the time to read for pleasure and she doesn't because I don't really exactly have the time to be reading so much. But because *I* get to read this amazing novel right now. My first experience with Gone With the Wind was in the 7th grade. It was Christmas. I saw that Gone With the Wind, this movie that I had heard about from somewhere (I honestly don't know where because I hadn't gotten into old movies yet, but somehow I *knew* it was *The* movie to watch), was on TCM. For whatever reason, I decided to read the screenplay as we watched the movie. I couldn't really explain why I wanted to read the screenplay as I watched the movie, but it was like I knew how much this story would affect me. So that's what happened. We watched the movie, I read the screenplay, and I was hooked. Maybe that same day, maybe another visit to my grandparents', I found a copy of the novel upstairs. This amazing movie was also a novel?! I took it. I didn't know how famous this book was. In my 13 year-old mind, it was a lost book that nobody paid much attention to. I felt like I was discovering something amazing that people had forgotten. I remember feeling a little bewildered when I realized how many people knew and loved my book because Gone With the Wind had become my book. It wasn't that I was selfishly trying to hold onto it. I was willing to share. But I wanted to share it with people, to turn them onto this amazing little secret that I had. I read the book. I inhaled the book. I absorbed the book. I probably even displayed poor manners and outright devoured the book. But I read it again and again. Ten times total from the 7th grade until I graduated high school. It's one of those books that resonates more with some people than others. I believe that it resonates more with Southerners because it's telling our story. Your heart swells with pride, hope, and acceptance as you turn the pages. You nod your head in complete understanding as the plot progresses. You laugh and cry as the passages dictate. From the time that I was 13 years-old, I adopted Scarlett as my role model. She may not have always done the most upright thing. But she did what she had to do to survive. She was strong. She was beautiful. She was really pretty smart. She had the personality that I always wanted. She had Rhett Butler, that symbol of earthy manliness that my exes never really lived up to, but against whom they were always measured. And for the last 11 years, she has been there. Sometimes at the back of my mind. Sometimes at the front. I've said ever since that first time that this is my favorite novel. Then why haven't I read it in six years? I really can't explain that. Maybe I took all I could take from it as a teenager and had to change enough to be able to take more from it. I am ready to again devour Gone With the Wind. I want to will myself into reading it more slowly this time, to let it soak in again, to get lost in the beauty of Mitchell's magic and not just get lost in Scarlett (although, I know that I will do this too). Some of the lessons I still remember and follow (sometimes you have to be a little bold to get by), others I remember and quietly ignore (not leaning on my elbows because it makes them ugly), and others I've downright forgotten. But this, this is the book that I want living in me. Pat Conroy describes in his preface how his mother lived this book. I used to live it too, but I lost it somewhere along the way. I'm ready to pick it back up now and carry it with me. Do any of you have a favorite book that resonates with you so deeply? Do you reread it often or do you just savor the last time you read it? Tell me about it. I'd love to hear. I have two books like that for me. One is "The Power of One" by Bryce Courtenay. It was actually assigned reading in high school that I loved. I think I read it annually. The other is the same as you. 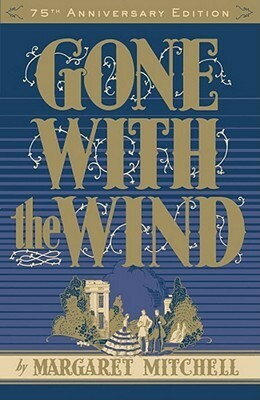 I read "Gone With the Wind" for the first time the summer after 7th grade and had that same fascination with it. I totally agree that there are plenty of things to admire about Scarlett (if she were a man 75% of what she's critisized for would be a non issue). Shortly after I read it the movie was rereleased to theatres. It's the first movie I went to by myself and at 13 I brought the average age down substantially. As much as I love the book, the movie didn't disappoint. The book and the movie complement each other. I feel the same way regarding GWTW. I read it for the first time at about 12 or 13, and have read it so many times through the years that I've lost count. At first, I commandeered my mother's hardcover copy, but after several readings, it fell apart and I had to buy a paperback. It never felt the same after that. I haven't been fortunate enough to read the book version of GWTW, but I have experienced the on-screen adaptation with my mum(and LOVED it). I think one of the books that resonates most with me is George Orwell's Animal Farm. I initially picked up the book as a youngster because I loved, well, the talking animals. It wasn't until high school when I read it for a government class that I got to learn what the book was really about. That book fostered my love for the political world and eventually moved me into my International Relations majour in college. It's amazing how inspiring books really can be! I actually first read Gone with the Wind when I was in 7th grade too! I checked it out on a whim from the library and I loved it so much that I ended up buying a copy of it from the now defunct Borders. I haven't watched the film of it yet, but it's definitely on my bucket list. My favorite book at the moment is probably Pride and Prejudice. I read it before I read Gone with the Wind and I'm still reading Pride and Prejudice. I'm not sure if I'll still love it in 5 years, but it's my go-to book when I was younger and even now. I love the film but I have never read the book. It sounds like something I have to do.:). I have a hard time deciding which book is most important to me...so many to choose! I would have to narrow it down to Anne of Green Gables (the whole series but the first book in particular I can quote front to back) and The Singers of Nevya series by Louise Marley (a soft sci fi series from the 90s and only 4.99 on Kindle!) l should get the Kindle version cause my paperbacks are in poor shape from so many readings. I also love Gone With the Wind, read it after seeing the movie in high school. And I did love the sequel Scarlett as well. Great post! Both of them are books I can pick up and read over and over. I read Gone With the Wind back in high school and absolutely fell in love with it as well. I've only managed to re-read it once since then but I would like to experience it again for sure! I've actually never seen the movie either. Maybe I should make an event of it! For me it was, and may always be, The Mists of Avalon by Marion Zimmer Bradley. I read it for the first time at 14 for an "Outside Reading Project" for my Freshman English class. We were told to pick something in the fantasy or science fiction genre. The minimum page requirement was 250 pages. I definitely overdid it a bit with a 900+ page book, but I am so glad I picked it. From the moment I picked it up I was hooked. I didn't want to leave my room for anything just so I could finish it. My mother had read it years before and loved it, so she actually let me stay home from school on Friday so I could read all day. Afterwards, I went on to read MZB's other Avalon based books and loved all of them as well. Around the time I read Mists MZB passed away and I was devastated. I had never wanted to meet an author so badly before and I had lost the opportunity. It is a goal of mine to acquire a signed copy of Mists one day. I think for me, my "Gone With The Wind" is "Pride And Prejudice." Every time I pick up any Jane Austen, but particularly that one, I get something new out of it but I also know that my beloved characters will be there and the incredible wit of Austen. It's great to have something that you can always count on. I love reading posts like this, because I can relate to everything you wrote so well; and I'll admit, it's great to have someone else say that Scarlett is their role model, and Rhett, the man against whom all others are measured, because I feel the same. The book with which I have these same memories is 'Outlander' by Diana Gabaldon. Just the same. When I reread it, it feels like coming home, and I want everyone to love it as much as I do. I keep a copy on my bedside table and flip through random scenes when I'm bored, or sad, or happy, or just in need of a fix.